There are many ways to extend a class. U you have the source for the class, then inheritance, which is covered in Chapter 4, is a great way to add functionality to your objects. What if the source code isn’t available? 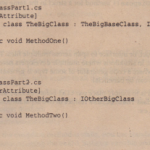 Extension methods can.help by allowing you to change a class without requiring the source code for the class. Notice the parameters for the AddToAmountmethod. For an extension method, the first parameter is the type that is being extended preceded by the this keyword. 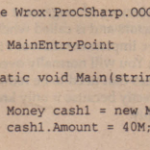 This is what tells the compiler that this method is part of the Moneytype. In this example Moneyis the type that is being extended. In the extension method you have access to all the public methods and properties of the type being extended. Even though the extension method. is static, you use standard instance method syntax. Notice that we called AddToAmo~ntusing the cashl instance variable and not using the type name. If the extension method has the same name as a method in the class, the extension method will never be called. Any instance methods already in the class take precedence. This chapter examined C# syntax for declaring and manipulating objects. You have seen how to declare stalic and instance fields, properties, methods, and constructors. You have also seen that C# adds some new features not present in the OOP model of some other languages – for example, static constructors provide a means of initializing static fields, whereas structs allow you to define types that do not require the use of the managed heap, which could lead to performance gains. You have also seen how all types in C# derive ultimately from the type System. Object, which means that all types start with a basic set of useful methods, including ToString ().